Buggies and truggies are the biggest targets for a well built .21 motor. 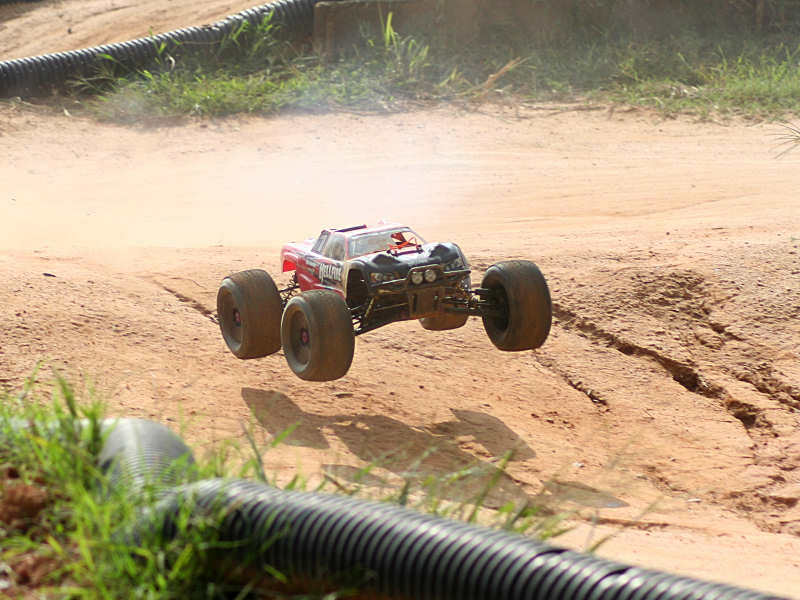 Even the bigger motors that are often included with vehicles such as the HPI Hellfire can’t compete with the power output provided by a well built competition-ready engine. O.S. knew this when they made the jump from a small block manufacturer to the big block scene. So it was natural that their first motor would be a .21-sized powerplant. While the V-Spec is targeted towards the racers, it’s interesting that it produces its heavy dose of power and still maintains legal status for classes restricted to three-ports. This move on the part of O.S. 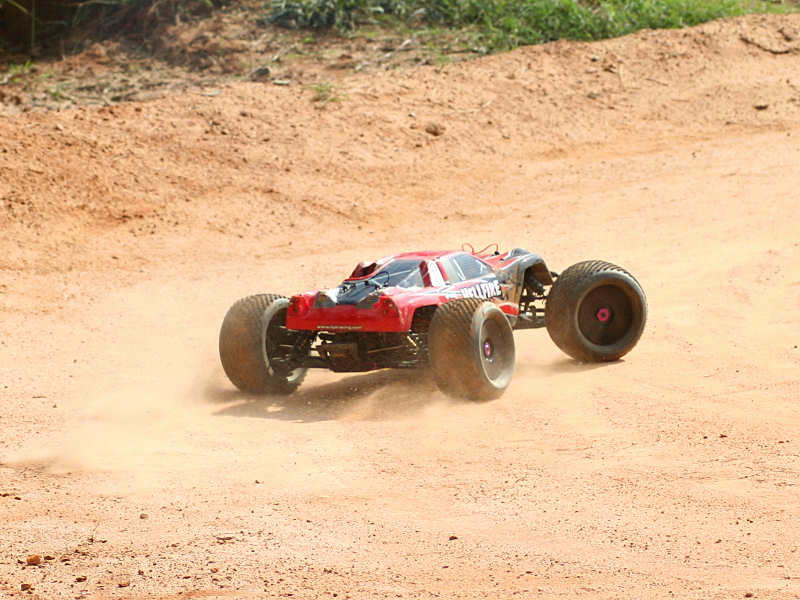 was intended to make it a favorite among those in the Sportsman classes, as well as still making it competitive for the more experienced racing classes as well. Keep all of that in mind, as it’s time to take this big blue powerhouse out for a little fun in the dirt. Follow along, as I can guarantee you won’t be disappointed! When buying an engine you know you aren’t going to receive a host of accessories as you might with a kit or Ready to Run (RTR) vehicle. However, some manufacturers do pack a few extra odds and ends in for some of their motors. With the reputation of the .21 V-Spec being a race-bred motor, O.S. expects you to use your own flywheel and clutch assemblies. However they do provide an exhaust gasket, extra head shim, and tuning inserts with o-rings for the carburetor. 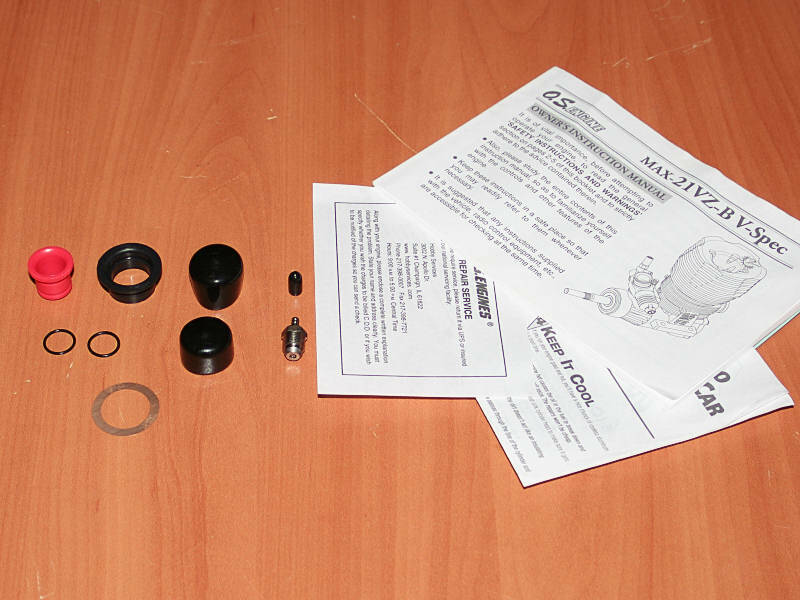 You’ll also find rubber caps to seal up the motor for storage, and supporting documentation. To further assist you, they also include their recommended P3 plug as well. 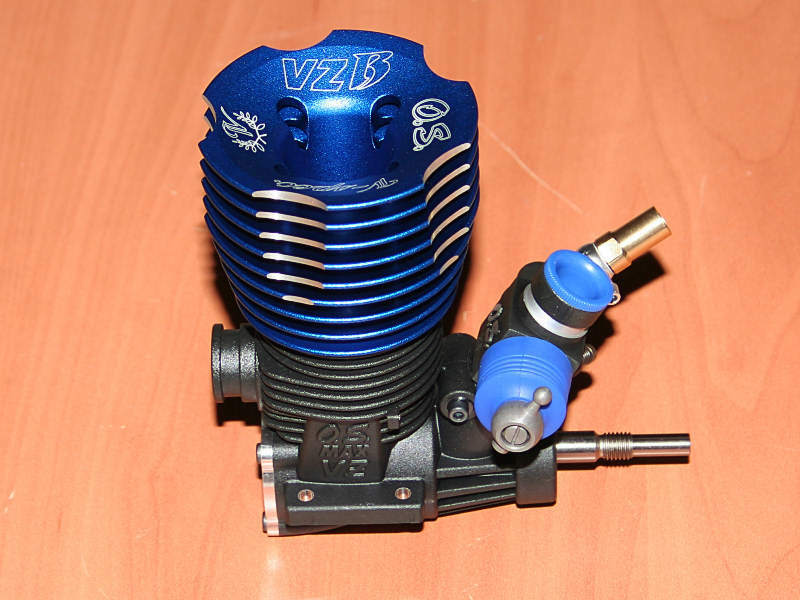 The V-Spec is a very sharp looking motor, which is easily identifiable to those who know what to look for. This is largely in part to the unique head design that O.S. 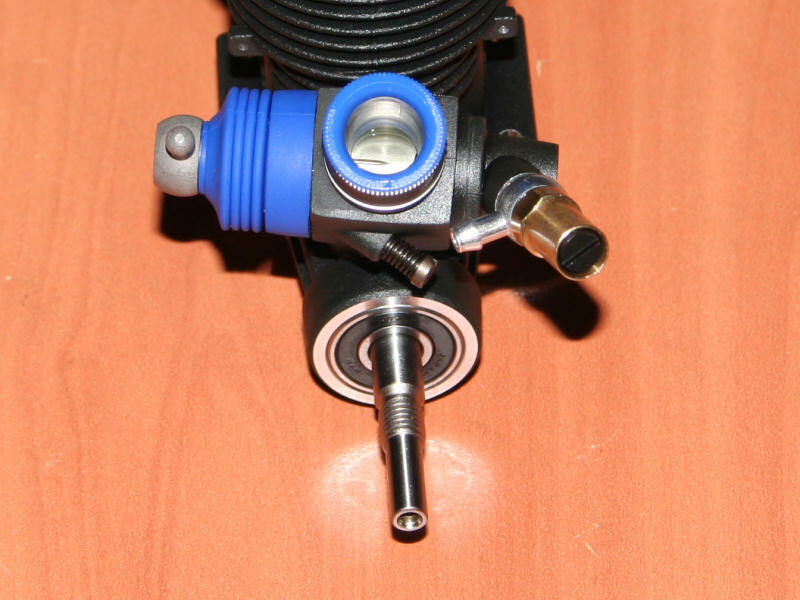 Max uses, making each one of their motors very distinguishable from the others they manufacture. 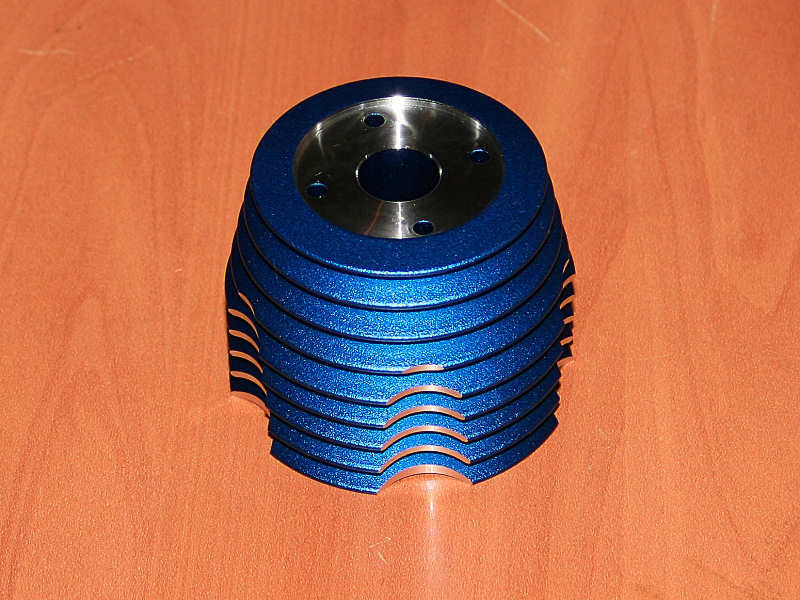 The head is anodized in bright blue, allowing it to be easily recognized as an O.S. motor when compared to the various number of colors used by other engine manufacturers. 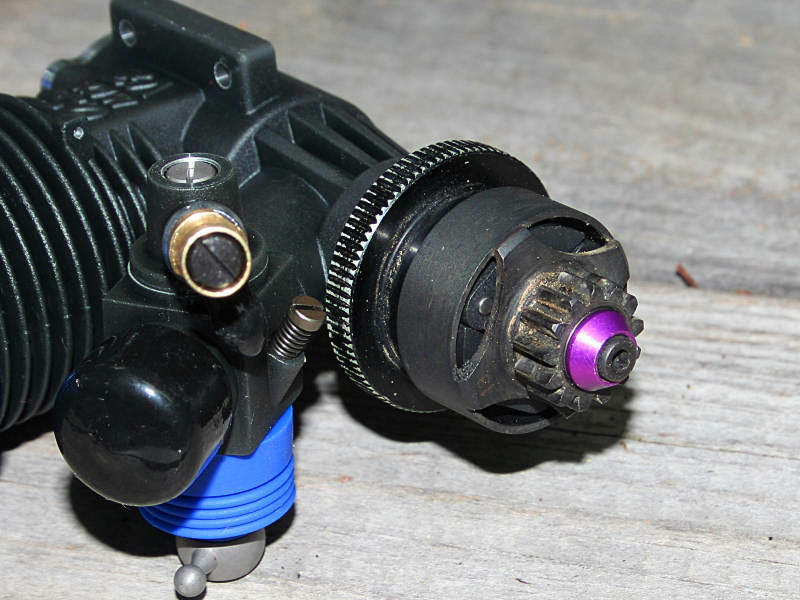 It should be noted, and pointed out, that this motor uses a bumpstart backplate, and therefore it is void of a starting method on the rear of the motor such as a recoil or rotary plate. While most hobbyists should understand that this means you have to use a starterbox, I do want to point out that you cannot simply swap the backplate out. The crankshaft itself is made to work this way as well. So if you wish to have your vehicle equipped with V-Spec power, make sure you plan accordingly. As with their other motors, O.S. emblazons the top of the V-Spec with lettering identifying it. While the unique shape of the engine’s head ought to make the model very obvious, the white lettering helps to make sure it’s an understood fact. If you remove the screws that hold the head to the engine’s block, you can remove the head and catch a good glimpse of what the underside holds in store. The head is machined aluminum, as plainly shown on its underside. 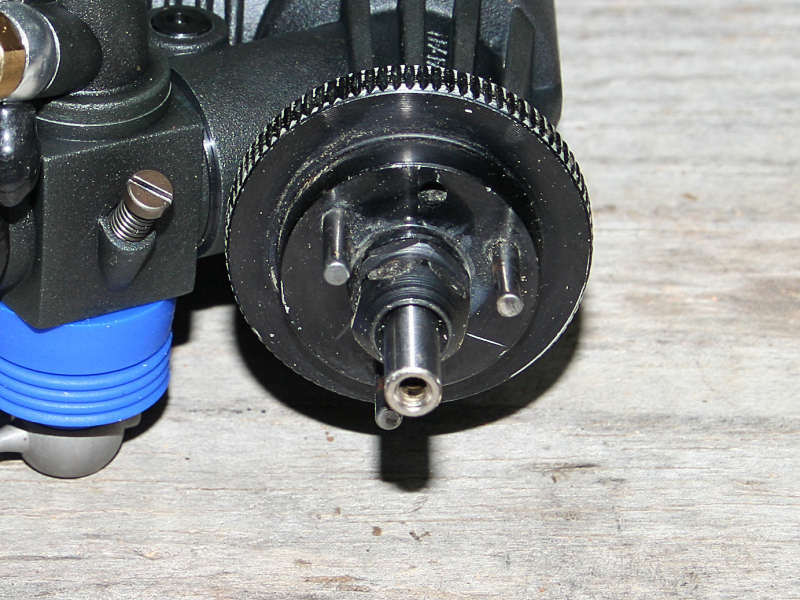 In addition, the button that houses the glow plug is a separate part from the head. This makes replacement of this item easy, should one get careless when replacing the plug. The button is also made with turbo-style plugs in mind as well. 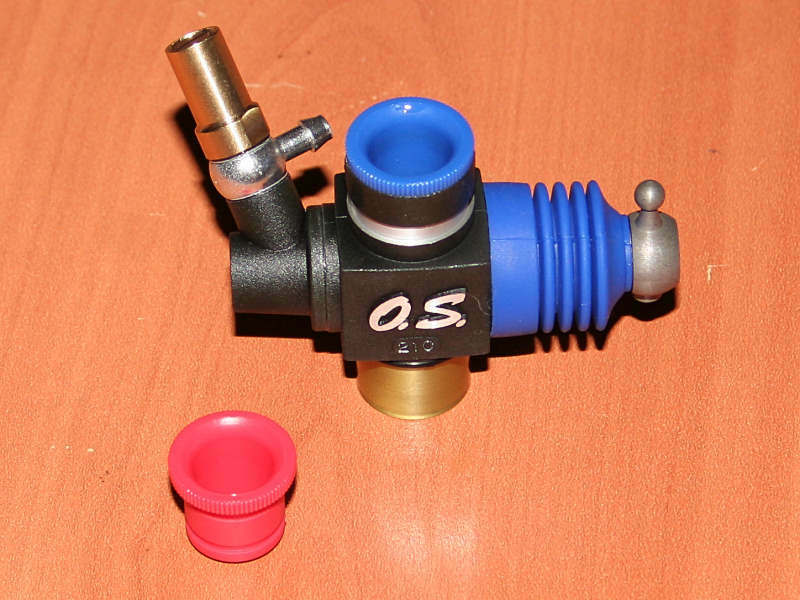 The upside to this style plug is that it doesn’t require a washer, and that the combustion chamber is much smoother than a standard plug. The result is an edge in power production, but the trade off is the cost in replacement plugs. Turbo plugs are generally twice the cost of a standard plug but, to a racer seeking the ultimate edge in power, this is of little concern. The V-Spec uses an aluminum-bodied slide carburetor to meter the incoming air and fuel. 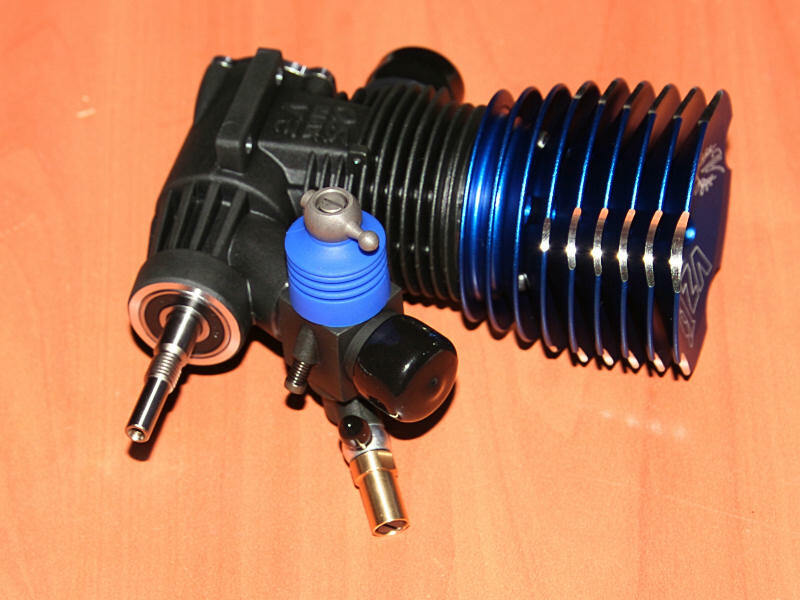 A blue silicone dust boot protects the slide from dirt and dust, and the carburetor’s throat is designed to work in conjunction with two plastic inserts. These inserts are 8mm and 9mm in their internal diameter sizes, and allow you to tailor the power output and fuel consumption to a level that suits your track conditions and driving style. 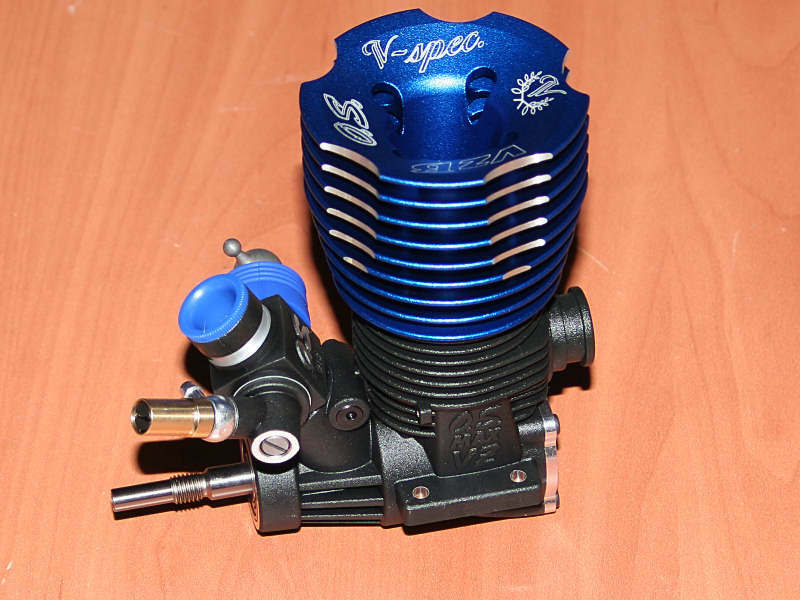 The V-Spec’s carburetor also features four adjustment possibilities. This gives you full control over the low and high end needles, as will as the mid-range (mixture adjustment), and the idle adjustment. All of these should be easily reached in most cases, although the tuned pipe on some buggies and truggies may make the idle adjustment a little tougher to reach. The O.S. 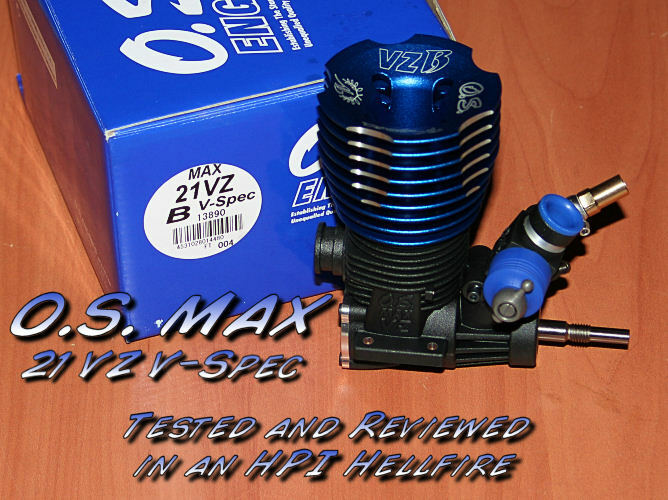 Max .21 V-Spec features a very well constructed engine block with black oxide finish color it’s outward facing side. Inside the block you’ll find precision porting, inside the machined portion of the block. These ports match the engine’s sleeve extremely well. The backplate covers the rear of the engine block, but since the engine is a bumpstart motor it doesn’t utilize a one-way bearing or starter mechanism. This helps to reduce parasitic drag on the motor internals. A rubber o-ring seals the backplate and block. 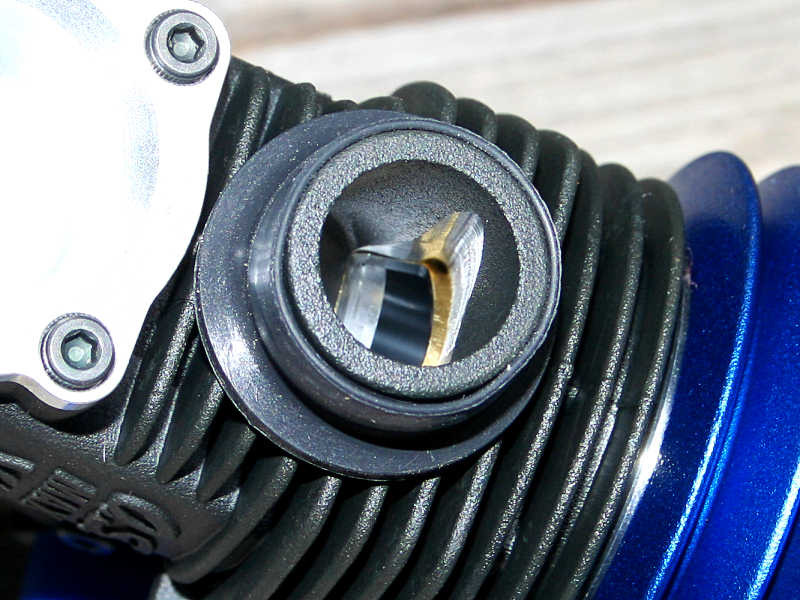 The top of the backplate sports a groove cut in it as well, allowing the piston to move low enough in the block to complete the necessary stroke it needs when providing its displacement. 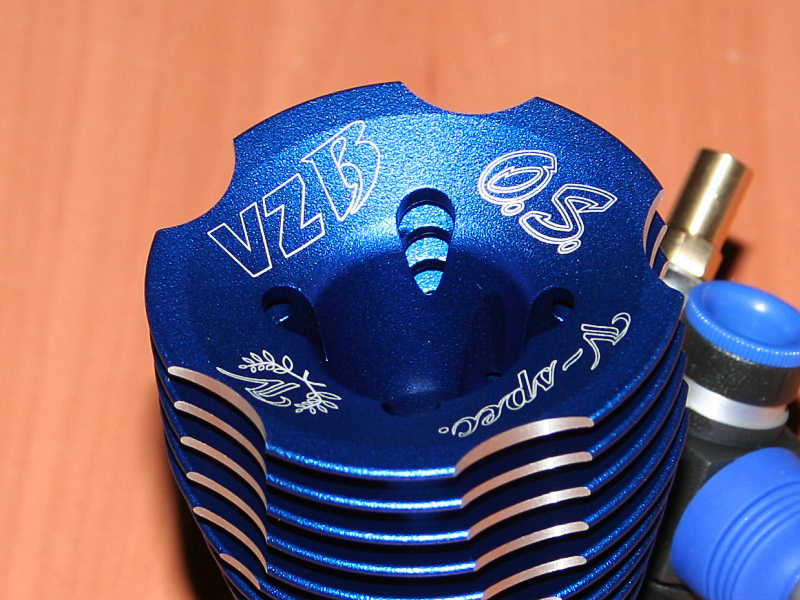 The V-Spec uses a billet aluminum piston, which shows the attention to detail O.S. Max has placed in the engine. 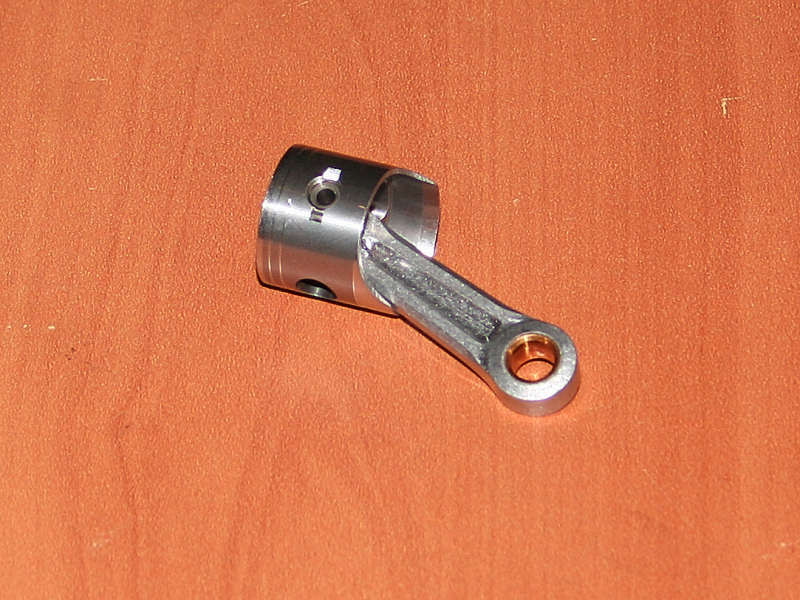 The connecting rod uses pressed in brass bushings, and an oil hole provides proper lubrication as the rod moves the piston up and down in the sleeve. The sides of the connecting rod use a knife-edged design, to reduce drag and weight which increases the motor’s horsepower. 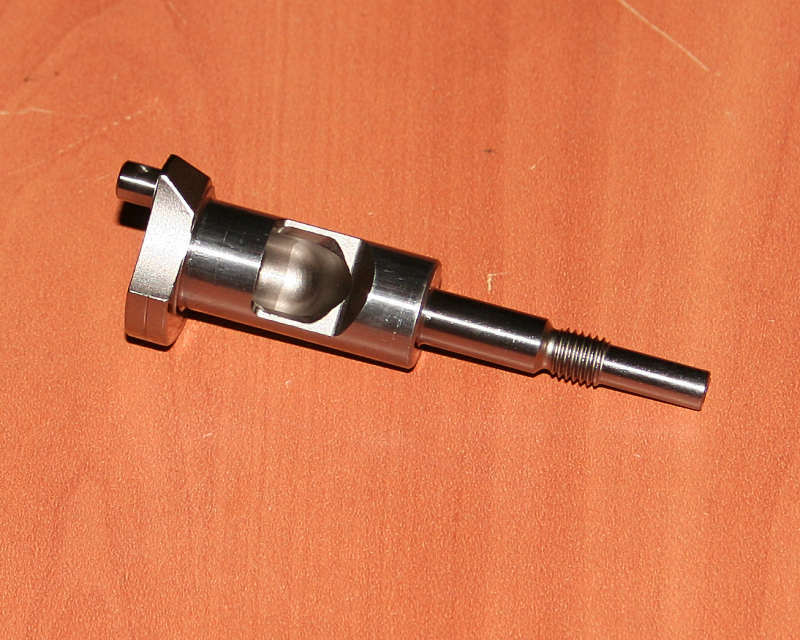 The piston provides a pair of oil grooves for excellent lubricating properties as the piston moves in the sleeve. 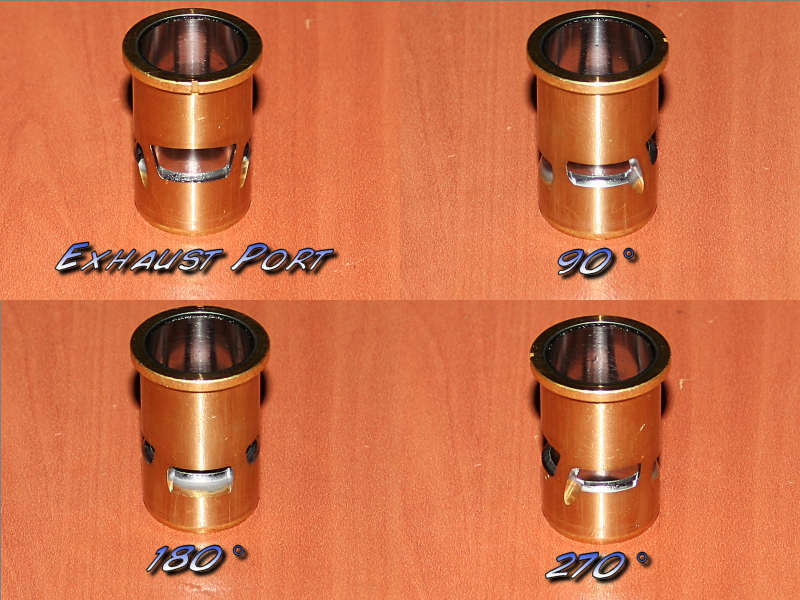 Cutouts in the side of the piston lighten its overall weight, making it easier for the rod and crankshaft to move it at higher RPM’s. The crankshaft used in the V-Spec is constructed from hardened steel, and machined to perfection. The counterweight is angled, for the purposes of lightening it, while the fuel chamber’s exit point is chamfered to provide a smooth path for the mix of fuel and air. 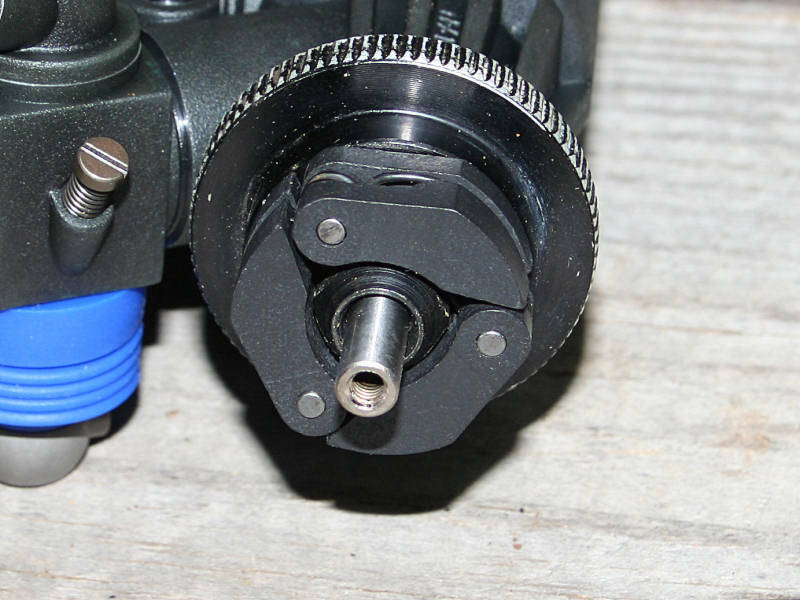 You’ll notice that the connecting rod nub has no provisions for a rear backplate shaft. This goes hand in hand with the fact I pointed out earlier, regarding that this motor needs to be used with a starter box. The crankshaft uses an SG-style end for the clutch bell and flywheel. The V-Spec’s sleeve is chrome plated, and uses three intake ports and one exhaust port. This gives it a standard three-port designation, since an exhaust port is a given and isn’t normally counted. This makes the V-Spec legal for racing in classes that have a three-port limitation. However, don’t be fooled into thinking that this means it can provide the power. Three ports can still provide plenty of power if used correctly, and the fact that O.S. has cut and angled these ports is further evidence of this. 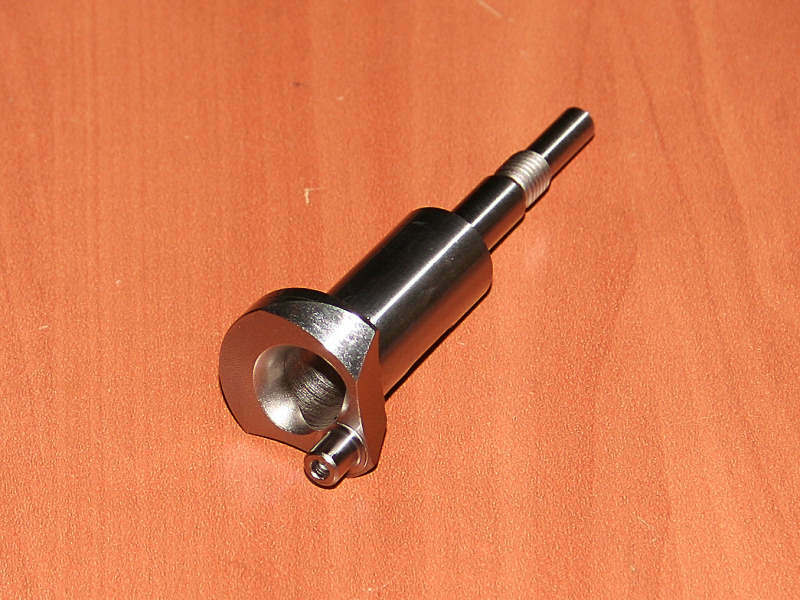 The porting modifications are easily seen with the sleeve in the 90° and 270° positions. 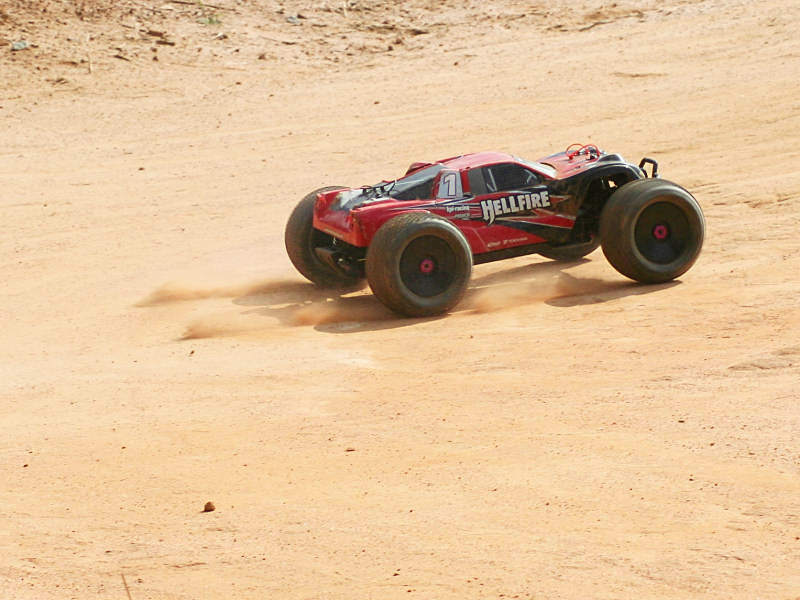 As a test vehicle, I chose to enlist the assistance of my HPI Hellfire. The first thing to do was to remove the shock motor from the vehicle. Given that the footprint of the two motors was the same, I simply removed the motor from the top and left the motor mount and brace in place. This would leave me with the same gap between the clutch bell and spur gear, and should save me from needing to adjust it after the swap. Once the stock motor was removed from the chassis, I set about removing the various components from it that would be needed on the V-Spec. These included the clutch shoes, clutch bell, flywheel, and other small parts. 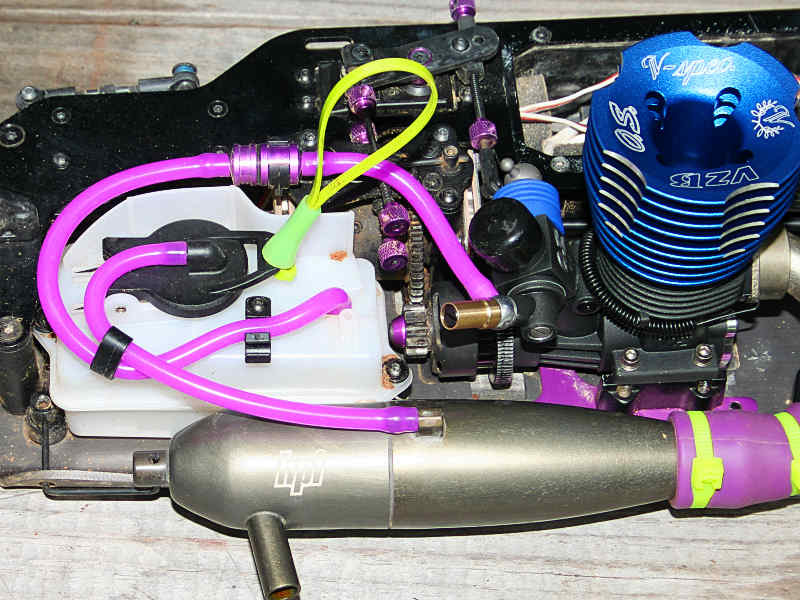 It also included the stock pipe and header. A motor swap is a good time to perform a detailed check of the components associated with the motor. Parts can be damaged, or wear out, over time. One good item to look at is the exhaust coupler. Mine had developed a small tear and needed to be replaced. 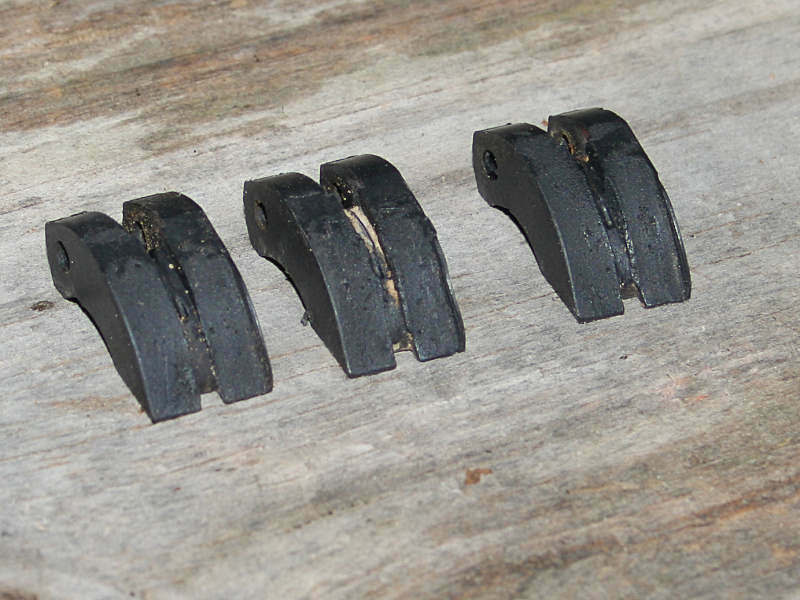 Even if the coupler had been in good shape, I would still recommend the replacement of the zipties. The plastic can become brittle over time, due to the heat, and potentially fail later on. Another good area to examine is the engine’s clutch shoes. My shoes were extremely worn, and appeared to have experienced some extreme slipping at times. So I trashed these, and installed a new set of shoes. A popular clutch configuration for big block motors is to replace one of the shoes with an aluminum one. Using a full set of aluminum shoes is often too much bite, but a single aluminum shoe with the rest as carbon tends to provide a good overall balance in many cases. I opted to use a full set of carbon shoes as a baseline however. With the parts inspected, I set about installing items onto the V-Spec. I slide the brass collet onto the crankshaft, and then pushed the flywheel into place. Using a flywheel wrench, I held the flywheel steady as I tightened the flywheel nut into place. 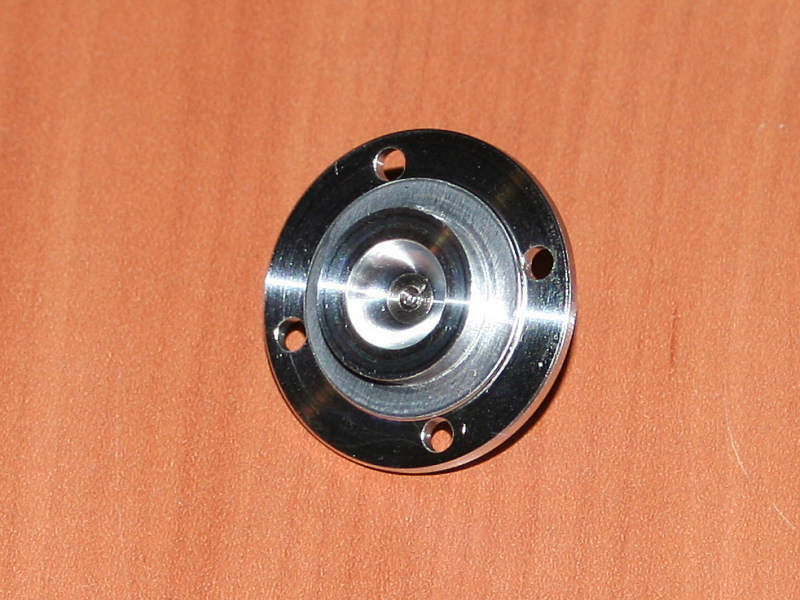 The flywheel nut compressed the flywheel completely onto the collet and shaft. Then I installed my clutch springs and shoes. The next order of business was to install the clutch bell, bearings, and shims. 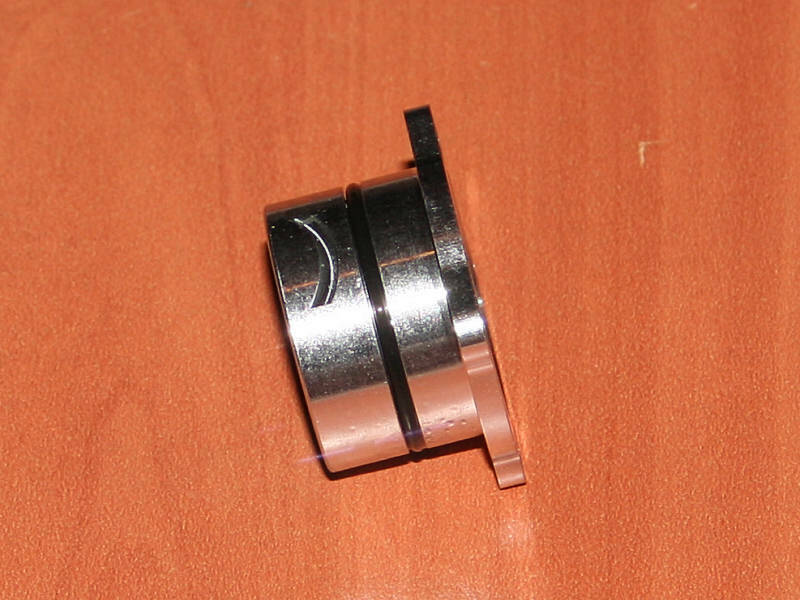 You should pay close attention to the bearings as they can sometimes be a potential failure point later on. If they feel gritty, or don’t spin smoothly, replace them. 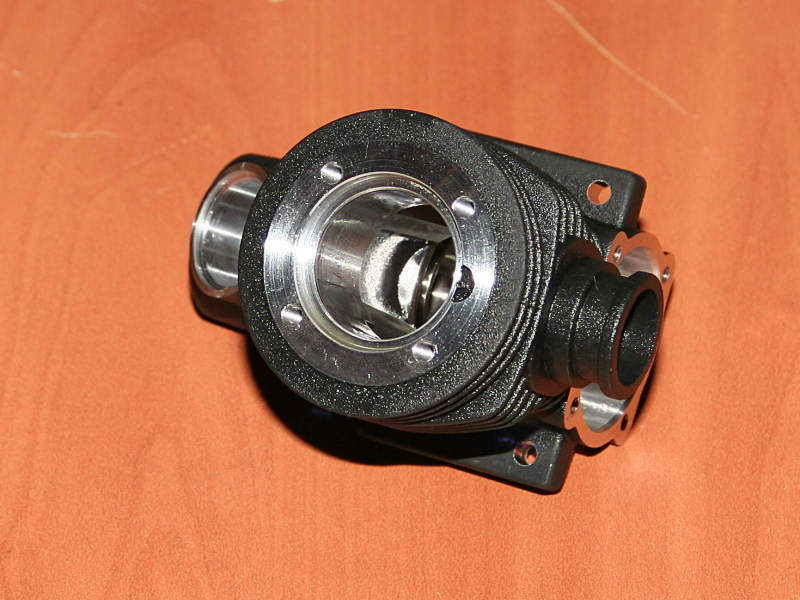 Once the clutch bell is secured by the screw, it should still rotate very smoothly and spin freely. If not, readjust the shims as necessary. Once I knew the shims where correct, I removed the screw and used a drop of Zap threadlock on it to keep it in place. 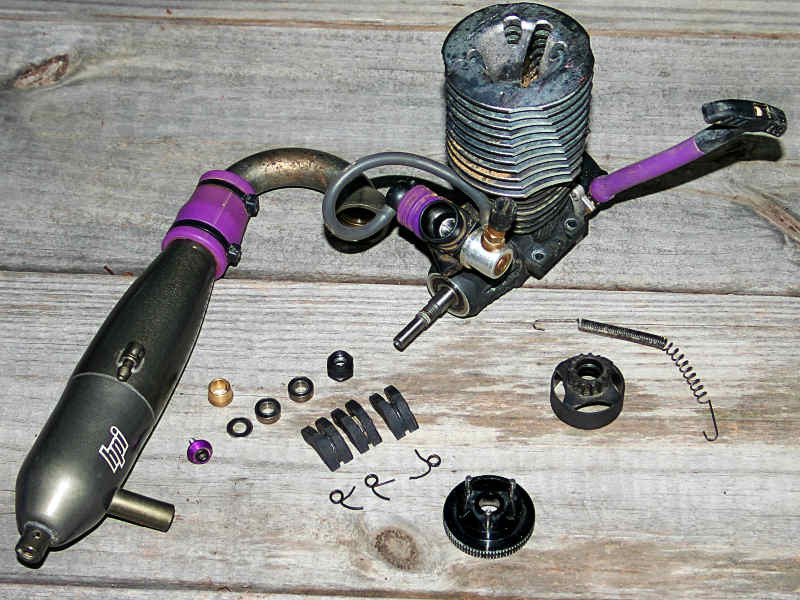 The last order of preparation is to install the header gasket, followed by the header and pipe. Once the engine is fully assembled, it’s time to drop it onto the chassis. I also took this opportunity to swap all of my fuel line with some new Dubro fuel line, as just with several other components this is a good time for replacement. With the motor in place, I was then ready to go! When it came time for break-in, I opted to choose the tried and true heat-cycle method to get the motor ready for optimal performance. I used O’Donnell 30% racing fuel for the break-in process, and I also used it throughout the testing. In addition, I only used the larger 9mm carburetor restrictor throughout testing as well. Initial startup was a little tough, as the motor’s piston and sleeve fit was very tight. The starter box had a tough time, despite the dual motors and battery packs, but after a couple of attempts it fired. The initial settings were very rich, and I had to make some adjustments to get the motor up to an operating temperature of around 200°. I also adjusted the idle and low speed needle as well, as the motor wanted to stall a little too easily with the default settings. Following the needle changes, I nursed the V-Spec through the break-in procedure and soon had it completed. Once the break-in was completed, I started to tune the V-Spec in an attempt to gain better overall performance. I leaned the needles a little more, as well as finalized my idle adjustment. Then I hit the track. The 21 V-Spec’s power difference was instantly recognizable over the stock motor. Even using the stock Hellfire clutch bell, the motor seemed to want to rev higher with a great deal more power on at all times. This came in handy with the Pro-Line bowties I had mounted on the Hellfire, as the power from the V-Spec could shoot the truck forward and up over the jumps in front of it with ease. Clearing the double wasn’t an issue, but more of a fact. Unless you really got the Hellfire out of shape, the V-Spec’s power gave you plenty of power to get a good run over the first double on the track. My preferred double-single line over the triple was just as easily managed as well, although the V-Spec could tackle the triple in one jump as well. However, the most impressive feat was the fact that the motor could easily get the Hellfire across the quadruple right before the straightaway. While I’ve seen this accomplished before, the V-Spec made it seem easy because it didn’t require an all out white-knuckled run to the first jump. This left you with a much more controlled landing, assisting you in setting yourself up for the turn into the straightaway. Even with the power at hand, I felt as if the V-Spec was topping out a little too soon on the straightaway. So I pulled the motor and swapped clutch bells. I jumped up to a 14-tooth clutch bell, from a 13-tooth, which helped this condition considerably. 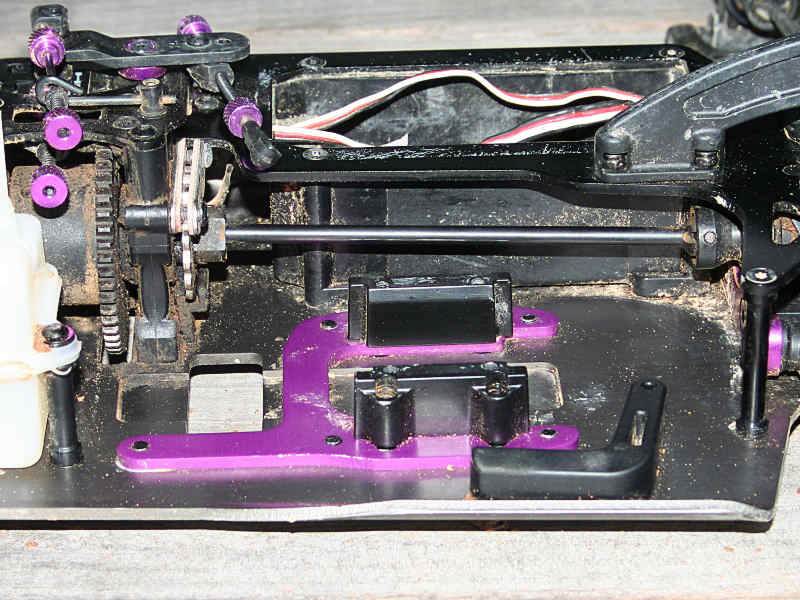 I also tried moving to a 15-tooth clutch bell, but found it suited the straightway more than the rest of the track. I didn’t want to feel as if I took away from the engine’s low-end power, I simply wanted to spread the power more evenly across the board. A large high-speed track would have likely made the 15-tooth clutch bell seem like the proper way to go. I even took the opportunity to swap the stock motor back into the Hellfire during the test, allowing me to see the difference between the motors in a back to back fashion. 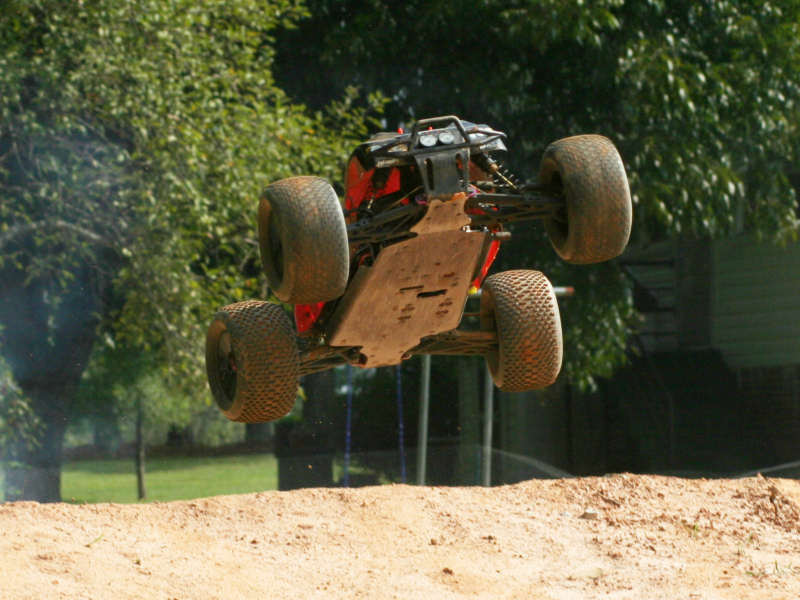 This simply confirmed the fact that the stock HPI motor, as strong as it is, was simply no match for the high output O.S. 21 V-Spec. The stock motor provides good low-end power, but simply doesn’t deliver the power in the upper end of the RPM range the way the V-Spec does. In addition, the V-Spec delivered the power much more smoothly across the board as well, whereas the stock motor seemed to feel as if it were simply controlled by an on/off switch in comparison. After swapping the V-Spec back into the Hellfire, and running a few more laps, I pulled the Hellfire back in to examine the motor once more. This time, I removed one of the carbon clutch shoes and replaced it with an aluminum one. This would provide just a little more track bite. While I expected this to overpower the truck a little more than using just the carbon shoes, I wanted to feel the difference. I was right in that aspect, but the V-Spec still seemed to be much smoother than the stock motor was in the lower RPM range. Based upon this I feel that, when the track has high traction on race day, this clutch shoe configuration will provide a slight increase in forward punch out of the corners while still being very controllable. 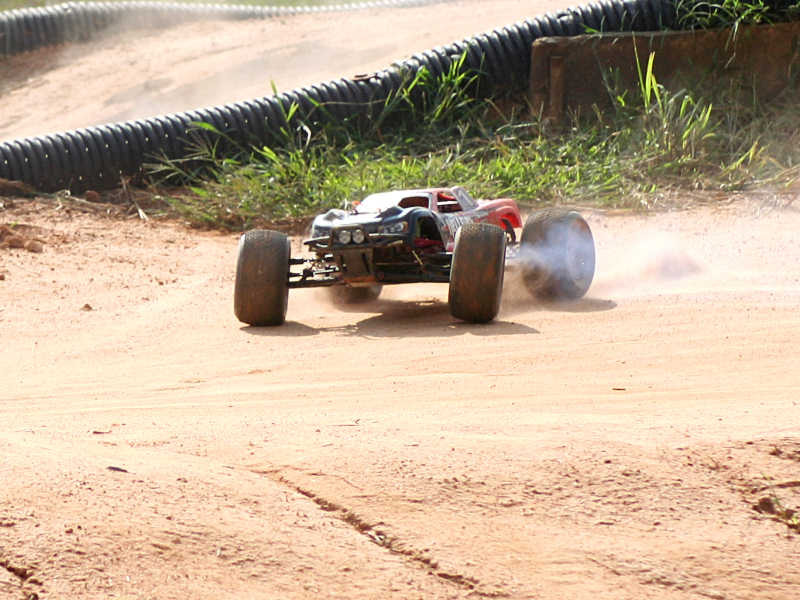 The power provided by the V-Spec is nothing short of amazing when compared to the stock Hellfire motor. 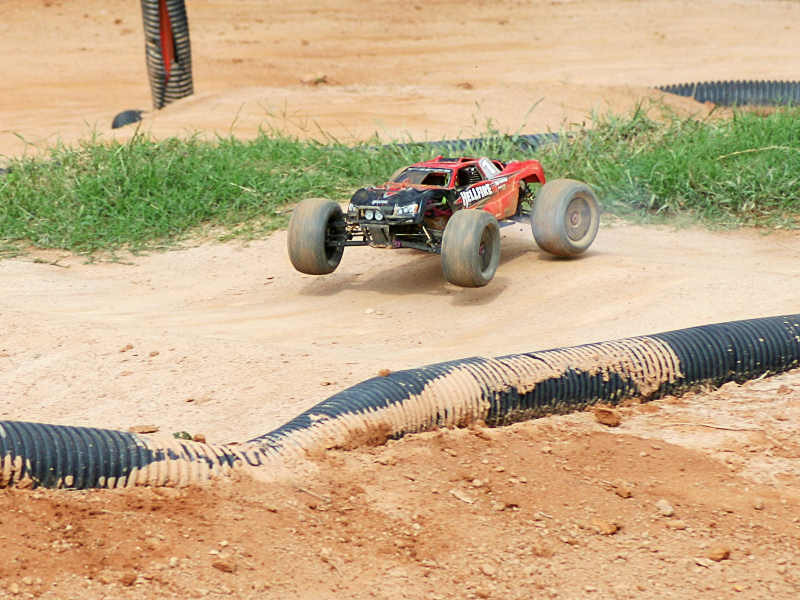 I felt as if it were almost too easy to push the truggy harder around the track, much more so than before. At the same time difficult sections of the track were often conquered easier, as the added power provided by the V-Spec meant that I could rely on it to get me moving after I had navigated through it. Before, I had found myself worrying more about keeping up my momentum. 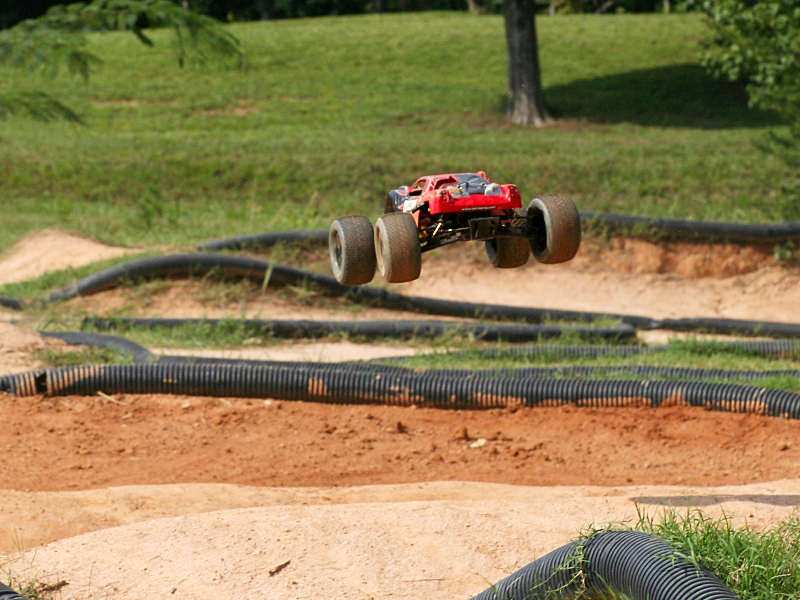 Simply said, this motor is the perfect choice for nearly any 1/8 scale buggy/truggy based platform out there! See the .21 V-Spec in action! The 21 V-Spec is, without a doubt, another winner in the O.S. engine lineup. O.S. has a long history of producing outstanding engines, and the V-Spec is one of their first forays into the big bock genre. Despite it being their first attempt, and the fact it still uses a simple three-port design, it is more than capable of running with anything else out there if put in the right hands. 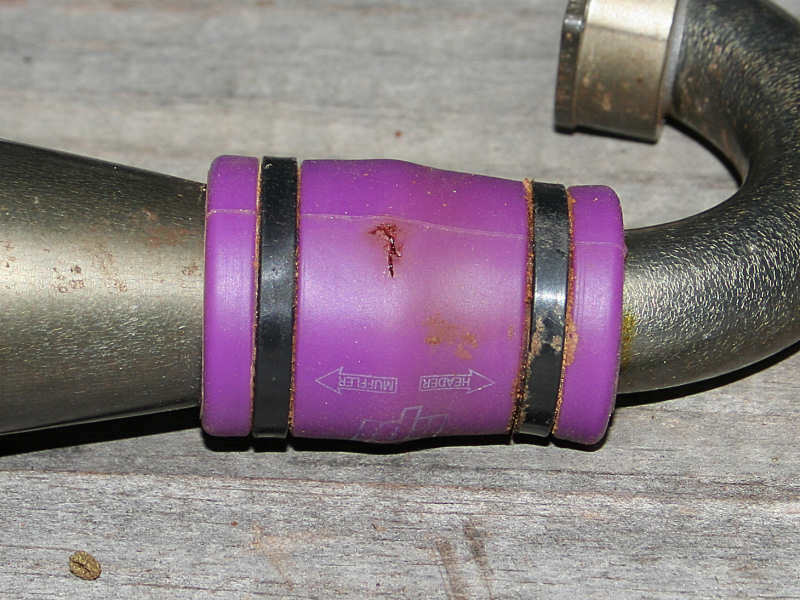 The one factor I didn’t alter during my testing was the tuned pipe and header. The stock Hellfire parts are geared more for low-end torque production, and therefore a swap could result in additional improvements. Obviously what pipe and what sort of change you’d want to see will vary. Track layout, size, and even driving style will play a role in this. However a more optimal pipe for the motor, such as the O.S. Max T-2050 would likely be a good choice in most circumstances. In the end though, regardless of what the V-Spec is used in and with, it’s very apparent that the track record O.S. has established will stay intact!